Mukkabaaz Review: Anurag Kashyap’s latest offering packs the right punch! BollywoodMDB brings you the review of Anurag Kashyap’s new film Mukkabaaz. So, read the review and decide if you want to watch the film or give it a miss. 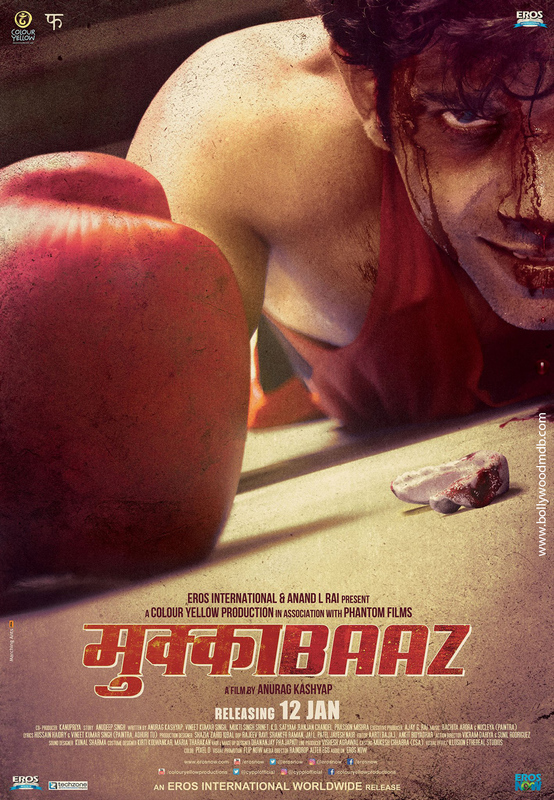 Mukkabaaz is the story of boxer Shravan Singh (Vineet Kumar Singh) from Bareilly, who falls in love with Sunaina Mishra (Zoya Hussain), the niece of Bhagwan Das Mishra (Jimmy Shergill). Bhagwan Das is a crooked and powerful man, who has a lot of clout over the area. To Shravan's dismay, he is also the head of the Boxing Federation and controls all the local boxers in the city. He doesn't like Shravan at all and tries his best to throw cold water on his dreams of making a career in boxing. However, fighting against all the odds, Shravan manages to win the state level boxing championship with the help of coach Sanjay Kumar (Ravi Kishan). Soon after winning the championship, he marries Sunaina, hurting the ego of Bhagwan Das further. Shravan's win helps him get a job in the railways, on ad-hoc basis though. For becoming a permanent railways employee, he has to win the national championship. Will he be able to do so? Will Bhagwan Das let him live a peaceful life or wreak havoc on his world? To know, watch the film in the cinema near you. Mukkabaaz boasts of a host of powerful actors who play their parts with utmost honesty. Actor Vineet Kumar Singh is seen in the lead role. In the character of Shravan Singh, he is perfectly cast. He has done a lot of hard work to get into the skin of the character and that shows conspicuously on the screen. His pain, emotions and angst are so real that you root for him throughout the movie. Talking about the female lead, debutante Zoya Hussain looks incredibly promising. She steals your heart with hee simplicity. Despite playing a dumb girl, she flawlessly uses her eyes to express emotions. She is definitely a talent to look forward to. Jimmy Shergill gets a powerful role to play and doesn't miss the opportunity to show his talent. He makes his menacing character believable. Ravi Kishan has a brief role, but he does full justice. Other actors in the supporting cast are also good. With Mukkabaaz, Anurag Kashyap is back to tell another unusual and riveting story. As we all know that Anurag writes for most of his films and has done the same for his latest outing as well. The writer-director-producer has come up with an interesting idea that invites you to invest in the film. He fleshes out his characters amazingly well, who bring his story to life. But the main problem with the film is that despite keeping you engrossed, it does not satisfies you because of its climax. It seems that Kashyap loses his interest in the movie towards the end and hence opts for a half-backed climax of convenience. We all know how competent Anurag is in telling his stories with utmost conviction. But Mukkabaaz does not fit in that category. Having said that, the film has enough meat to ensure that you do not feel cheated. While you may fail to find any fault in other technical aspects of the film, one area that cannot miss your attention is the editing. Like always editor Aarti Bajaj has done her job pretty well, but in the first half of the film only. While the first half of the film flows like an uninterrupted river, the second half gives you the feel of a bumpy road, especially towards the last quarter of the movie. Bajaj seems to have lost her grip towards the end. Mukkabaaz is over 2:30 hours long and tests your patience as it races towards its conclusion. Cinematography and background score are impressive. Like his unusual stories, the soundtrack of Anurag Kashyap’s films is always different. The music of his latest offering, Mukkabaaz, does complete justice to the environment the film is set in. Composed by Nucleya and written by actor Vineet Kumar Singh, the song ‘Paintra’ is an amazing composition. With powerful lyrics and energetic rap by Divine, it is an unmissable song. Another song ‘Mushkil Hai Apna Mel’ in the voice of Brijesh Shandilya is also great. The third song ‘Bahut Hua Samman’ works well because of its intelligently written lyrics. The remaining two songs are also good, but lack the shelf life. Overall, the music of Mukkabaaz is situational and syncs well with the narrative of the film. Watch Mukkabaaz if you are an Anurag Kashyap fan and love his cinema and unique style of storytelling. You can enjoy this film even if you are not a great admirer of his movies. In a nutshell, Mukkabaaz qualifies for at least one watch in any case.